SUPER dedicated Woking fundraiser Robert Jones has rolled his sleeves all the way up and immersed himself in the job of drumming up much-needed capital for Woking Mind and Crossroads Care Surrey. Robert commits himself fully to doing whatever he thinks may benefit the Woking community, now and in the future. Marathon on April 26, and aims to raise £1,000. Not that his efforts will stop at that – he is already working on plans for more schemes in the months to come. Having set up the twitter account @robertmjones86 specifically for fundraising communications, Rob is determined to get his message across to as many potential sponsors as he can reach. Thanks to his many and varied ideas – such as a photo-shoot with Crossroads Care Surrey and prolific letter-writing to local companies – he is getting a good deal of positive response. And he isn’t selective about who his appeals go out to, so it’s entirely possible you’ve already heard from him yourself. 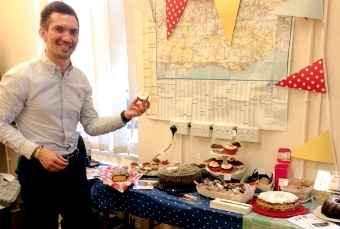 Rob’s fundraisers involve such disparate things as cake sales and car washes, and after one recent cake sale made £150 for good causes, the prognosis for his further achievements is rosy. The campaigning never stops, and he is happy to take on pretty well any challenge, and to overcome all obstacles to them. Earlier this month he guested on Radio Woking’s We Love Woking show, on which he discussed his fundraising and the rigorous training he puts himself through – to further spread the word. He even sees nights out as fundraising opportunities, and most recently he has organised a party on April 11 at Old Woking’s Crown and Anchor pub which, apart from including the obligatory raffle and good music, has a sponsored head-shave as one highlight. There can be few better ways of alerting people to his efforts than by exploiting the reach of social networking sites and the internet in general. To this end Rob blogs (uk.virginmoneygiving.com/giving) about his past, present and future projects, and posts updates on how well he’s generating the cash. Ultimately driven by the need to make a difference to people in plight, Rob can’t help but reveal his genuine enthusiasm for the work of his two chosen charities. IF YOU want to sponsor Rob, or just donate to his chosen charities, you can do so online at www.virginmoneygiving.com/robertmattijones. Alternatively, call 07956339705 or email robertmattijones@gmail.com.